I’ve just got back from the field, with so many stories to tell and pictures to show, to the news that ColaLife’s Kit Yamoyo has won the Product category of the Designs of the Year 2013. The maverick in me thinks it’s fantastic that something designed with the poor and for the poor, and with the word ‘diarrhoea’ in it, has won a mainstream, international design award. I think it’s safe to say that this hasn’t happened before and I congratulate the judges for being so brave. This decision is going to save even more lives – people need to know that diarrhoea, a minor inconvenience in more developed countries, is the second biggest killer of under 5 children in sub-Saharan Africa – and this will help. Jane has quickly put this press release together which covers the main points we’d like to say. A ‘kitchen table’ concept, now saving children’s lives in Africa, has been selected by The Design Museum as Product Design of the Year 2013, beating off competition such as the Olympic Cauldron. It must be the first time that an anti-diarrhoea kit takes centre stage as a design icon, standing alongside a renovated tower block in Paris, a film on fashion and a UK Government website. The concept stems from a question that bothered UK Aid worker Simon Berry in Zambia, in 1988: Coca-Cola is available even in remote villages yet simple medicines to treat the second biggest childhood killer, diarrhoea, are not. Why? When Simon re-visited the idea in 2008, his wife Jane suggested making use of the unused space in a cola crate to carry an anti-diarrhoea kit. By 2009, Simon and Jane had set up the ColaLife charity, and, from their kitchen table – using Social Media – won the goodwill of Coca-Cola to explore the idea. Funded by an award from UnLtd in 2010, they gave up their jobs to bring together some of the best minds from big business, academia and non-profits: supply chain experts, health experts, logistics and design. These included Rohit Ramchandani, now ColaLife’s Public Health Advisor. 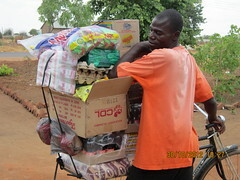 Visits to Zambia were funded by Simon’s Boulogne-Biarritz Cycle ride in September 2010. 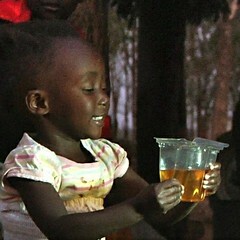 After a chance meeting at a presentation, packaging expert PI Global took the brief to design a robust pack to carry WHO recommended diarrhoea treatments, a clever plastic container which, vitally, helps illiterate mothers in rural Africa accurately measure water for the child-sized sachets of Oral Rehydration Salts it provides. 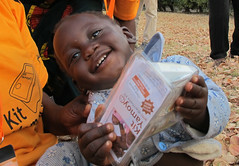 Also containing Zinc to help prevent diarrhoea recurring and soap for hand-washing, the pack – dubbed ‘AidPod’ by the BBC – acts as a cup and a re-sealable storage vessel. Most important, ‘Kit Yamoyo’ was designed with input from African mothers and carers, most of whom live many hours’ walk from a health centre. In Zambia, where a trial is underway, independent rural retailers are buying it by the boxful, to carry out to their small shops in remote villages, because it’s designed to yield a profit – just like Coca-Cola does. These retailers, trained by the project, have, in the last 6 months, bought over 20,000 Kit Yamoyo, to sell at ZMK5 each (just under $1). The most promising retailers are not only serving their own community but making a gross profit on this new product of $25 to $60 per month. In rural Zambia, that feeds a family. Simon and Jane Berry will be at The Design Museum to collect their award on 16/04/13 and in London on 17/04/13. ColaLife is an independent registered charity, number 1142516, entirely run by volunteers. WELL DONE COLA LIFE TEAM – THAT’S GREAT NEWS! AND this decision will also influence and inspire many designers and design decisions to help change more lives! Thank you so much for the work you are doing! CONGRATULATIONS!!! Amazing news – you must be thrilled. Thank you so much for sharing this – I really appreciate it. Great idea for a super worthwhile cause……cracking idea. Congrats and well done! !